(TibetanReview.net, Dec07, 2016) – China has on Dec 5 delivered its standard line about the Indian state of Arunachal Pradesh being a disputed territory, responding to the visit there by one of Tibet’s most prominent religious figures, the 17th Karmapa Urgyen Trinley Dorje who lives in exile in the country. It called on India not to do anything to complicate their border dispute. The Karmapa, 31, the third most prominent figure in Tibetan Buddhism in terms of following and influence, fled Chinese ruled Tibet in Dec 1999, citing lack of religious freedom and freedom to pursue his religious study. He arrived in India in Jan 2000 and has lived close to the residence of Tibet’s exiled spiritual leader, the Dalai Lama, in Dharamshala ever since. 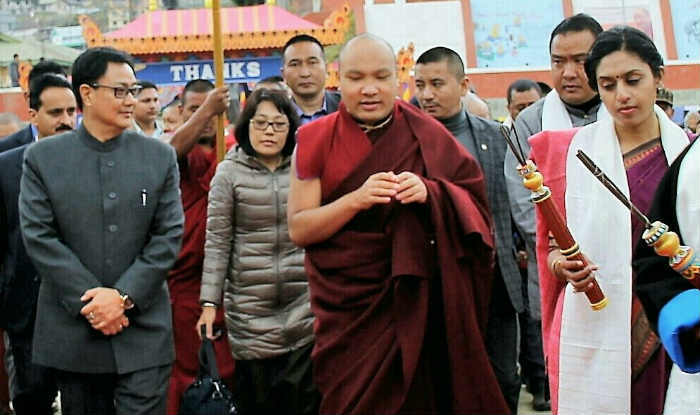 China has so far not condemned or criticized the Karmapa, insisting, in the immediate aftermath of his escape, that he had only gone on a visit to India and would be returning home. India only recently lifted restrictions on the Karmapa’s movement. And during his visit to Arunachal, he was accompanied by India’s Minister of State for Home Affairs Mr Kiren Rijiju, who tweeted that this was the first visit by a Karmapa to the place since that of the 3rd Karmapa some 900 years ago. The visit came six months after the Cabinet Committee on Security, headed by Prime Minister Narendra Modi, lifted restrictions on the Karmapa’s movement. “China’s position on the eastern section of the China India border is clear and consistent,” China’s Foreign Ministry spokesperson Lu Kang told reporters. However, while asking India to not “complicate” the boundary dispute, he refrained from criticising the Karmapa. During the visit the Karmapa addressed the public at Tawang Monastery and toured other monasteries and places as well. His four-day visit, which began on Nov 28, took place ahead of a scheduled tour of the state by the Dalai Lama in Mar 2017.